“James A. Garfield News” is a big hit! Morning announcements at JAG Elementary are now being visually broadcasted by a group of students from our Student Leadership Team. Listening to news and information over the speaker system has given way to viewing daily newscasts via YouTube. Students, staff, as well as parents, have given this transformation rave reviews. As you walk by any classroom during announcements, you will see students transfixed by the live broadcast. All it took to get things started was a staff member making mention to Technology Coordinator Mrs. Melinda Ensinger how exciting it would be to do announcements over the air. From there, Mrs. Ensinger reached out to students and staff and the idea soon became a reality. The backbone of the broadcasts lies within the school’s Student Leadership Team. Led by Mrs. Jenn Ring and Mrs. Kristina Cupples, this leadership organization includes twenty-one students representing grades three through six. 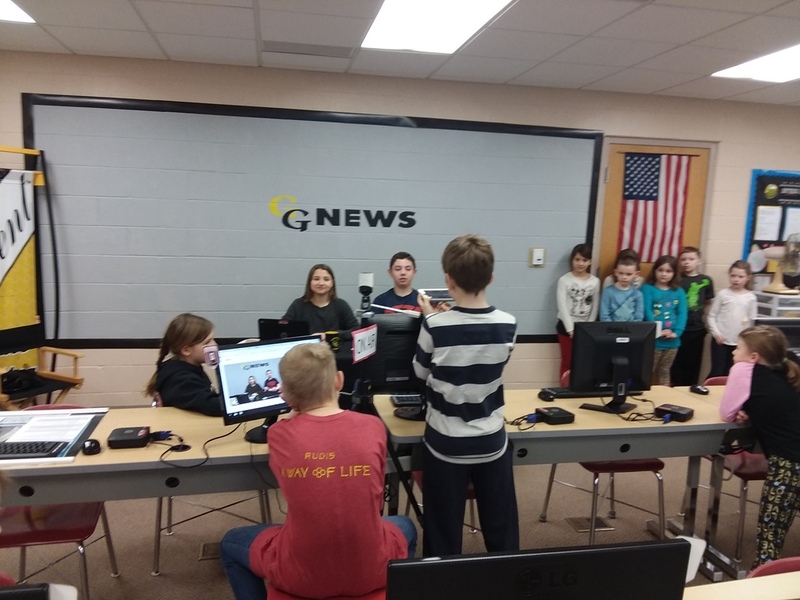 Like many of the school community projects this group has taken on, these students were eager to volunteer for the range of roles needed to run a successful news broadcast. There are two news anchor teams who share the daily spotlight. Hallie Cebulla and Jack Carmichael form one team, while the other anchor team consists of Zoey May and Caleb Canan. Rebecca Evans and Aidan McCon make up the Junior Broadcasters who perform a Wednesday news segment. James A. Garfield News is directed by Lily Shay. In charge of the scripts are Leah Bailey and Max Paul. Finn Frato-Sweeney runs the iPad and Brody Justice is the cameraman. Other members of the Student Leadership Team will soon be joining the news team to contribute their talents as well. The remaining SLT members include third graders Amaya Basinger, SadieMae Ewell, and Joy Justice. Fourth graders are Kellyn Bartlett, Mandy Cardinal, and Kaelyn Tasker. Fifth graders are McKenna Alai, Kyla Grace, and Abigail Kaufman. Sixth graders are Layla Strok and Kali Tasker. Aside from students, staff, and parents now being able to watch daily newscasts, there comes another valuable benefit. The students broadcasting the news are gaining confidence and skills that will aide them later in life. After speaking with them, you come away knowing they are in it for all the right reasons. The group consensus was that they enjoy being involved, they wanted to try something new, and they knew it would benefit the school. For those interested in viewing JAG News you can visit bit.ly/JAGNews or go to www.youtube.com and search JAG Elementary.